Do you want to enjoy your vacation and not cook? Let your personal chef create a package just for you. All too often our busy life-styles force us to choose fast food or tasteless frozen entrees when we would much rather enjoy the benefits of good, home-cooked meals. Unfortunately, our busy schedules leave us little time to plan or to shop for and prepare the kind of food we would like to eat. 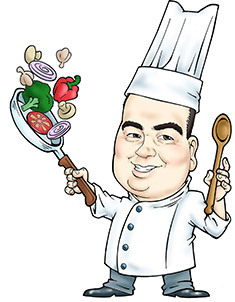 Chef of Your Own, Personal Chef Service, is your "What's for Dinner?" Solution. Imagine coming home from work, put dinner in the oven, help the kids with their homework or just relax. You will truly enjoy the time your personal chef gives back to you. Time to focus on something other than "What's for Dinner???"